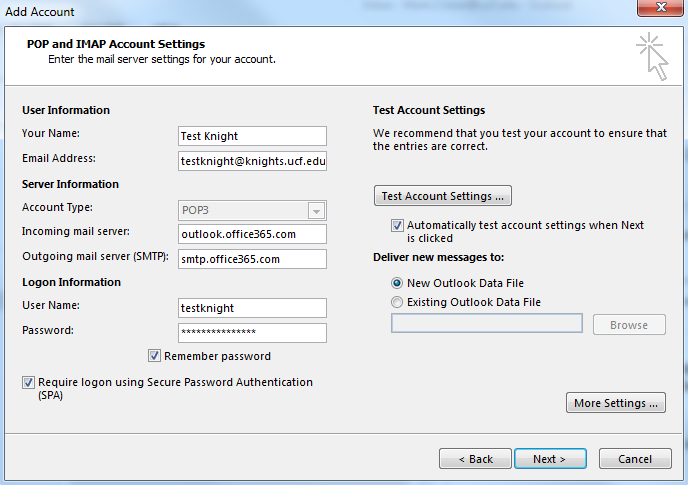 Download "Knights Email Outlook 2013 Configuration"
1 Knights Outlook 2013 Configuration Contents Need Help?... 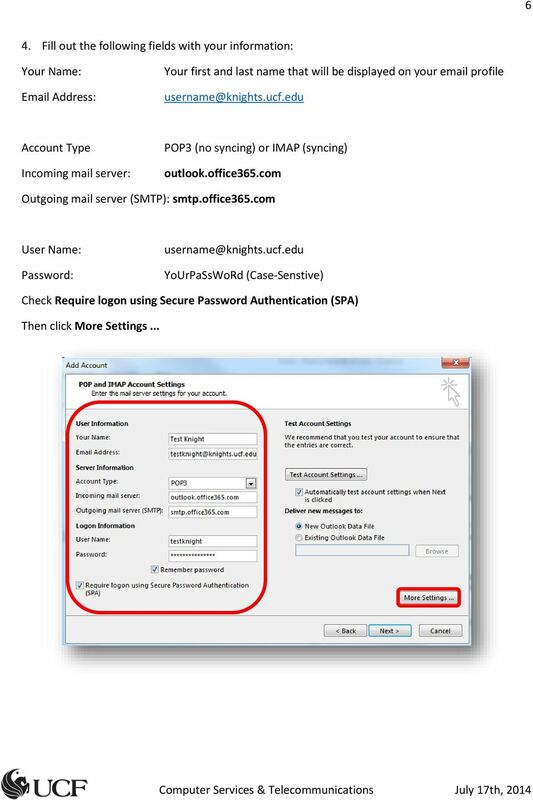 1 Configuration in Outlook... 1 Exchange/ActiveSync Configuration... 1 IMAP and POP Configuration... 4 IMAP and POP Configuration in Outlook General POP/IMAP Settings Need Help? 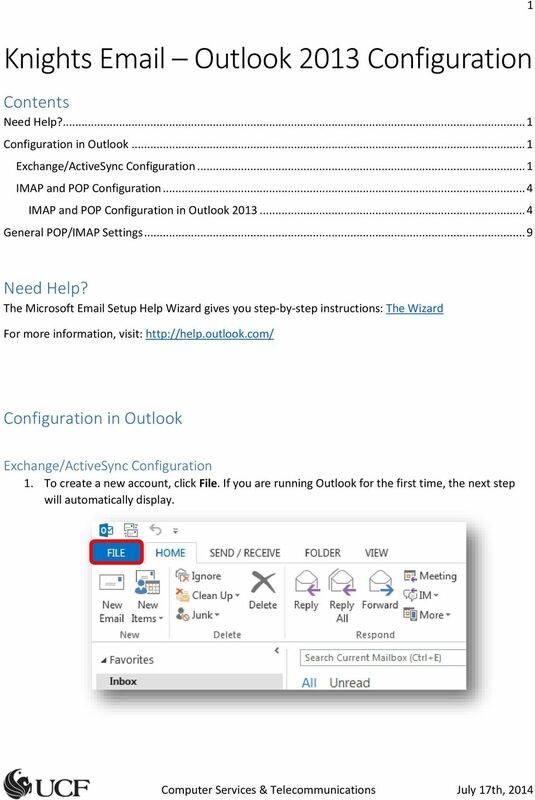 The Microsoft Setup Help Wizard gives you step-by-step instructions: The Wizard For more information, visit: Configuration in Outlook Exchange/ActiveSync Configuration 1. To create a new account, click File. 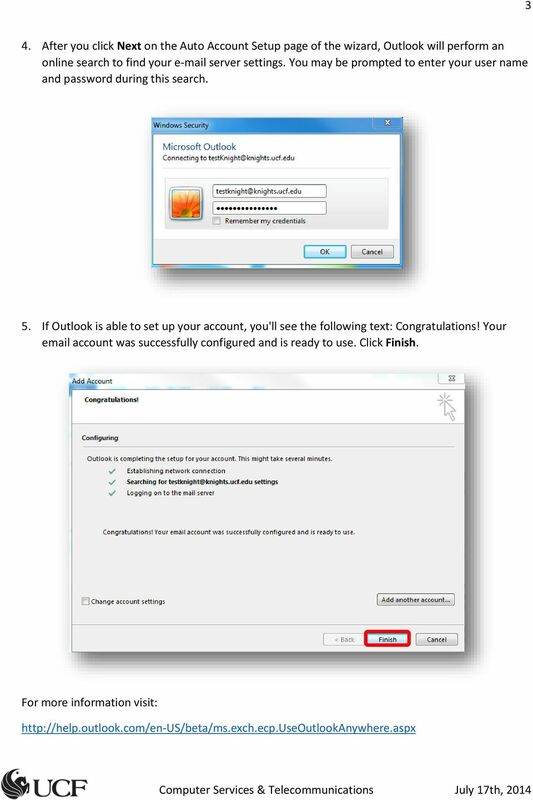 If you are running Outlook for the first time, the next step will automatically display. 2 2 2. Click Add Account. 3. 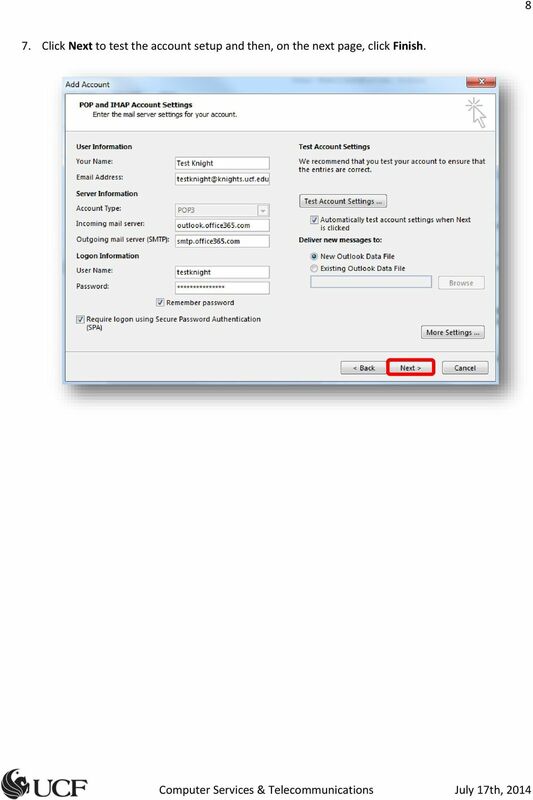 Enter in the information that appears in the box Auto Account Setup. Your Name: Put your first and last name as you want it to appear to others. 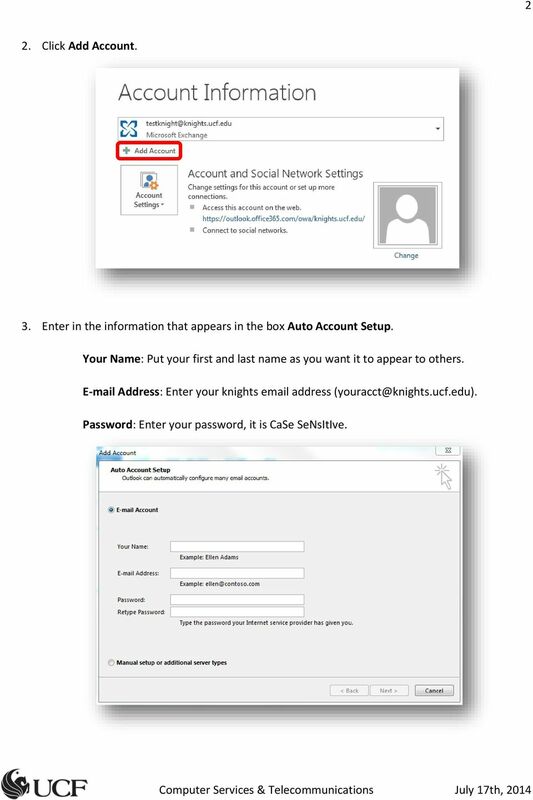 Address: Enter your knights address Password: Enter your password, it is CaSe SeNsItIve. 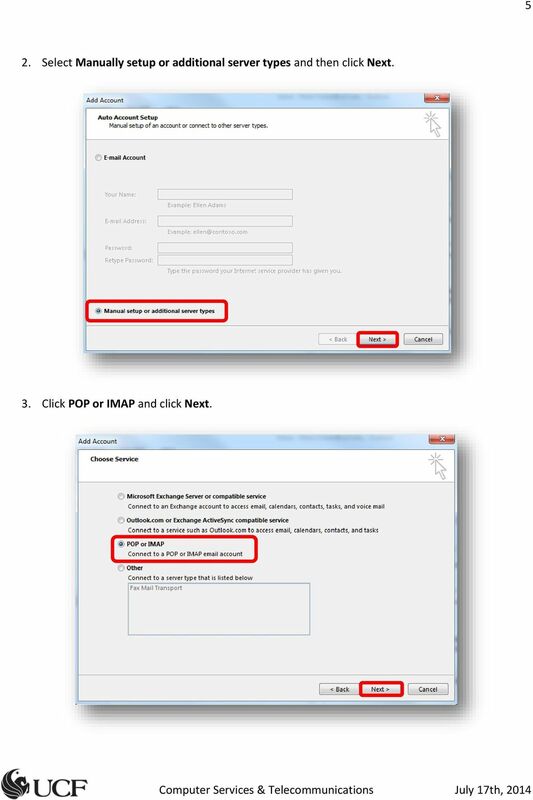 4 4 IMAP and POP Configuration IMAP allows you to have just your synced between devices. 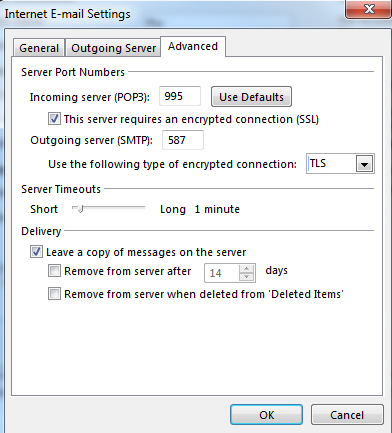 POP allows you to send and receive mail, but it is not synced with any other devices. 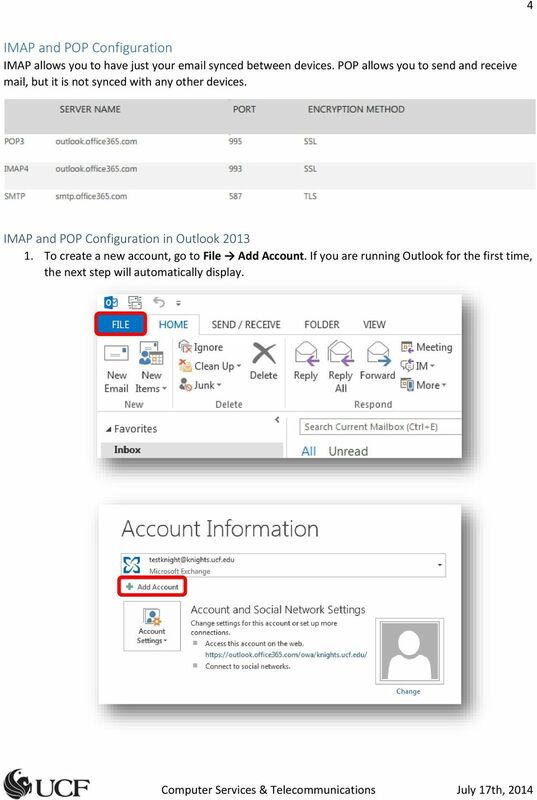 IMAP and POP Configuration in Outlook To create a new account, go to File Add Account. 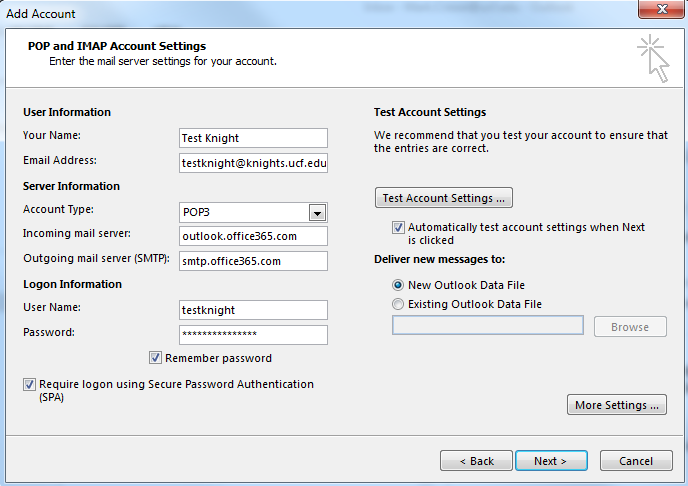 If you are running Outlook for the first time, the next step will automatically display. 5 5 2. 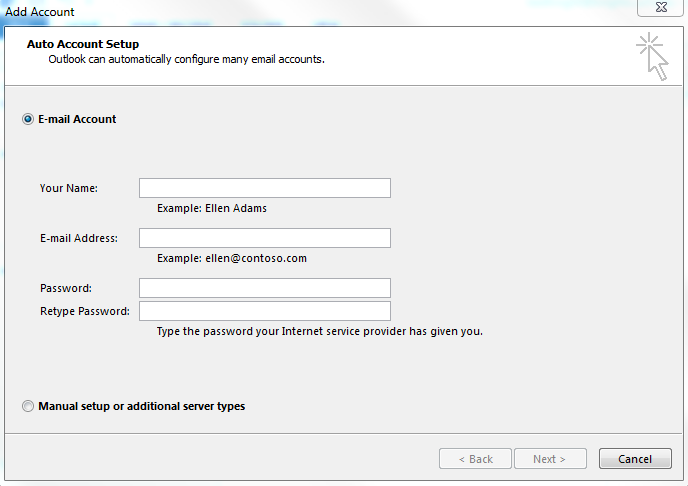 Select Manually setup or additional server types and then click Next. 3. Click POP or IMAP and click Next. 7 7 5. Click the Outgoing Server tab. 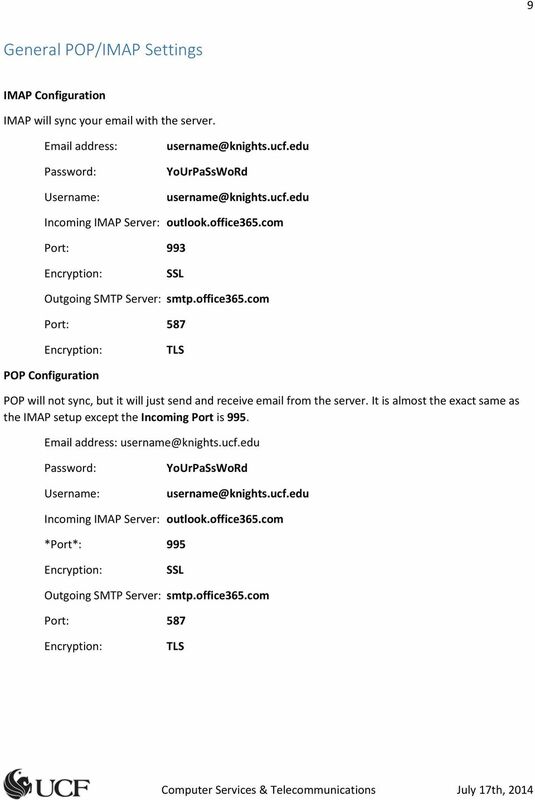 Check the box: My outgoing server (SMTP) requires authentication. 6. Select the Advanced tab. 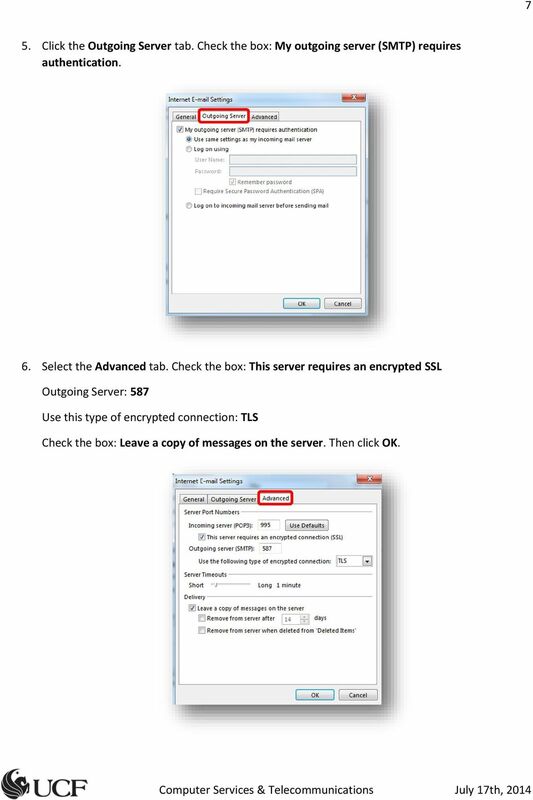 Check the box: This server requires an encrypted SSL Outgoing Server: 587 Use this type of encrypted connection: TLS Check the box: Leave a copy of messages on the server. Then click OK.
8 8 7. 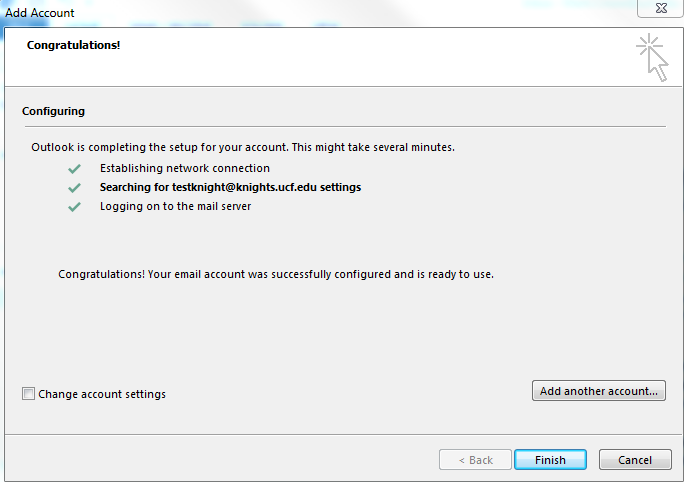 Click Next to test the account setup and then, on the next page, click Finish. 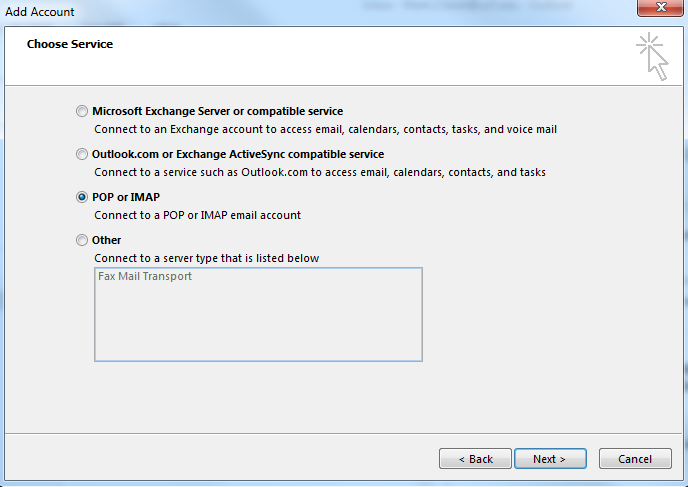 5-9-2014 A.Bueter Set up an Exchange connection to your email in Outlook 2010 or Outlook 2013 Note: Outlook 2007 is not supported with Office 365/Exchange Online- only Outlook 2010 & 2013 will work. 1.